When we signed up for our trout fishing adventure on the Tongariro River we had no idea that the most adventuresome part would be getting there! To reach our fishing spot we had to cross a fast flowing section of the river complete with slimy rocks and a strong waist high current. Despite using the proper ‘linked arms’ crossing technique, one group member took a plunge and ended up wet but without injury, handling it all very well. Our adventure arose from an earlier visit to Turangi, at the bottom of Lake Taupo, when a fly fisherman gifted me a rainbow trout after we had been admiring his skill – and photographing his catch. Suitably inspired, a return visit was organised with AWOL to try our hand at catching trout for the first time. We arranged two fishing guides (John and Jim) for our group of six novices to get some basic tuition before trying our hand at the real thing. We were kitted up in waders, boots and camouflage-style wet weather jackets – no bright colours please, it distracts the fish! The outfit is completed with warm socks, leggings and fleece tops, all very necessary when standing waist deep in the 12 degree C water of the snow fed river. After being properly licensed for the day’s fishing it was off to find a secluded spot away from the regulars – space to learn the ropes away from critical eyes. Our first choice was rather populated so Plan B was invoked; involving the river crossing to reach another of John’s hidden gems. And a gem it was, sheltered from the wind with plenty of space for our fly fishing lesson. There is a lot to learn – including the lingo! Our first attempts at fly fishing technique induced a certain amount of hilarity (no, hooking the fly on the back of your waders is not an approved technique!) but with John’s expert coaching we quickly built up our skills. And then there was the matter of the intricate knots required. Contrary to what you would expect, power is concentrated on the back motion as you cast the line back and forth before dropping it towards your target (fish). 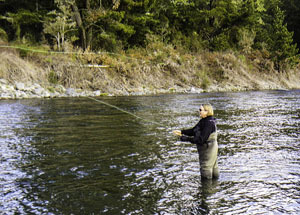 Having established the basics we learned about false casting, a technique of swinging the line back and forth above the water to extend the reach. Then we tried mending – flipping the line on the surface in a wavy motion. The idea is to present the (artificial) fly to the trout so it looks like the real thing (easier said than done)! Soon with some basic skills in hand we were ready to try the real thing. John was confident there were plenty of trout for us to catch, but the reality is harder than it looks. One of our party, Gael had a take but unfortunately it got away … and we had a few more near misses. Worse yet, after the flies were attached my recently learned skills evaporated and I spent most of the time untangling knots on the line! Just to prove the fish were really there, as we were getting ready to fish an experienced trout fisher arrived and positioned himself down river from us – correct etiquette as we had arrived first. However he soon realised we were novices and decided to move back upstream. Then he caught three trout in quick succession before gently releasing each one. So that’s how you do it! In spite of our lack of skill (and success) the lovely spring day with the sun glistening on sparkling gin clear water was very relaxing. 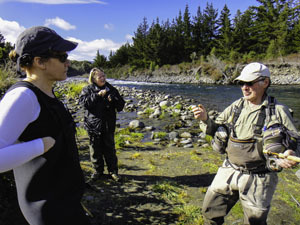 Another of our party, Kaye aptly described fly fishing as an ‘elegant’ experience. We now have more understanding of the intricacies of this unique outdoor pastime, and admiration for the experts. No fresh trout for dinner for us this time. But we have some unfinished business – and the trout will be there for next time.